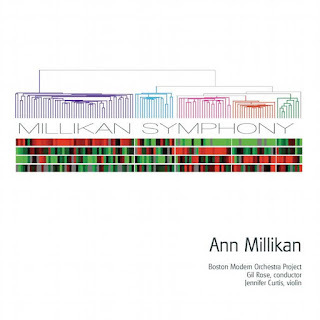 The excellent Boston Modern Music Project under Gil Rose returns for the music of a New American Composer of note, namely Ann Millikan and her full-length Millikan Symphony (Innova 981). Now I must say that dealing with a plethora of New Music most every day has its challenges, for me especially in the constant interplay of same and different. Commonly there will be stylistic traits in New Music that tend to cluster in groups and can be identified. In the end, though, what matters about a composer or a work is how those clusters reverberate in the individual sense, or on the other hand what is not to be found if it does not seem to be there, how sometimes you do not hear such a reverberation much. 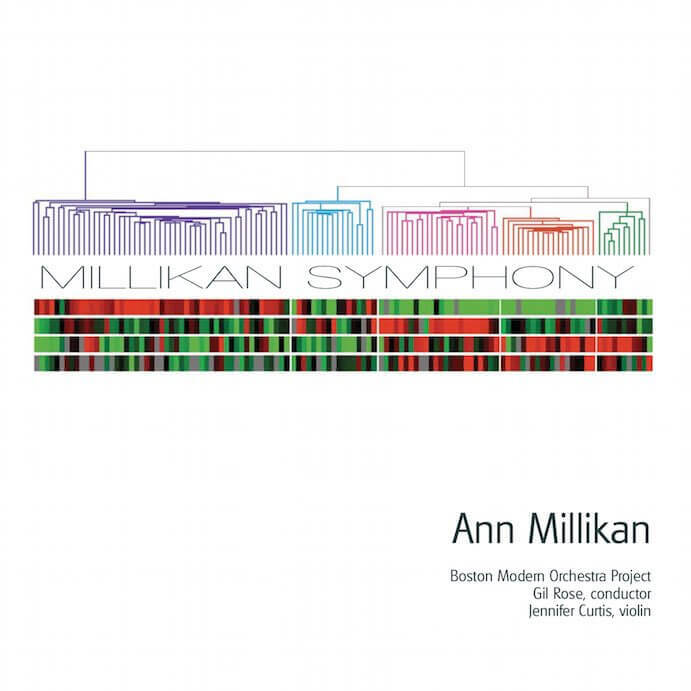 In the case of Ann Millikan and her Millikan Symphony, what she does with some Modern traits is much more important than the newness or oldness of the traits themselves. Listening to Millikan Symphony it is supremely important to hear the work closely, more than once. Otherwise the traits themselves will be the main apprehension and the special putting together might totally pass you by. A reasoned, considered judgement on New Music is a complex give and take of content and structure. So I would venture to say that the structuring of the content of Millikan Symphony is the critical aspect that sets it apart. Sure if you look at each piece as a piece you might identify Copland pastoral tenderness, Stravinskian Neo-Classical heroic regality, maybe some of the orchestral dynamics of some of the most celebrated big orchestrators (I won't say Richard Strauss here because it is not quite that), maybe the Harrisonian delicious articulation of flute and strings, the moody mystery of Post-Tone Poetry, and more. Yet thanks to the very gradated excellence of the BMOP performance and what the score calls for, there is a kind of inner organicism of spirit and a narrative thrust that is a story in itself. This is a work of hommage, of Ann to her brother Robert, dead at the age of 55 in 2012, a brilliant epidemiologist, a pioneer on the incidence of breast cancer, a dedicated veterinarian, a lover of nature and a profoundly musical soul. The five movements of the work unravel and reveal a special aspect of Robert the human. There is the "Science" movement, one for "Animals," "Rowing," and "Violin." Polyrhythmic and tonally expanded, the music is at once beholden to the legacy of High Modernism and also too to the grand narrative style of the most revered orchestral masters. The music comes out of a collaborative venture planned over the years between Robert and Ann. Some of the music was dictated by Robert to Ann; the principal"Violin" movement theme has Robert's compositional hand upon it. Milliken Symphony is the triumphant result of the two in their musical closeness, yet also stunningly a backward view of Robert's many tiered life via the hindsight of its passing. It is hard to imagine a more moving tribute. Even though we may know next to nothing about Robert's life, something very strong of its essence comes through throughout. After very many listens I come away from the work feeling like I have heard something of real significance. All those superficial traits at the first listen have become enigmatically original along with the flow and pacing and structure. It is not a work you put on first time and give a loud "wow!" to in response. The wow effect builds. Then, you know. Or I knew, anyway. Wow. You would do well to venture upon this music and its very satisfying performance by BMOP. It is subtle in the beginning of your interaction, then the it becomes more and more clearly, identifiably special. I do recommend you spend some serious time with this. Ann Millikan is a living treasure!